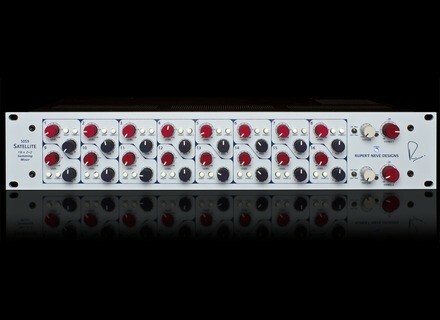 5059 Satellite, Analog Mixer from Rupert Neve Designs. The 5059 comes in a 2U, rack-mountable chassis. Each 5059 features 16 channels with individual level, pan, inserts, stereo-2 sends, and master texture controls, providing integration with outboard equipment, ccontrol for two separate stem mixes, and the ability to dial in analogue mojo in two modes. The 5059 features custom transformers and class-A topologies. Channel inserts are provided in the 5059 to streamline interconnections with analogue outboard equipment and to allow for expansions of the 5059’s capabilities. By connecting a second 5059 to the insert outputs of a 5059, the dual stereo outputs can be used as a way to add 4 auxes to each of the 16 channels. Texture controls with Silk and Silk+ modes are designed to allow the engineer to fine tune the harmonic ratio and tonality of each stereo send of the 5059. The Silk mode accentuates the transformer saturation in the high frequencies to add a “sparkle” to tracks. The Silk + mode accentuates the saturation of the low frequencies to add thickness and density to the source. Visit rupertneve.com for more details. [Musikmesse] Boss VE-5 Boss announces the VE-5 Vocal Performer, a personal effects processor and looper for vocalists.